Doug Jeffries, a long-time reader of the blog, recently got a fly in Fly Fishing in Salt Waters (a magazine I subscribe to). My mag hasn’t arrived yet, so I found out about it through Scott Heywood’s blog Fly Paper. 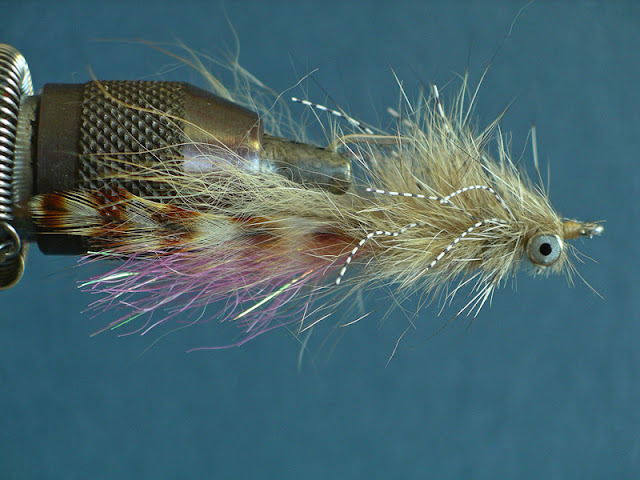 It is, indeed, a fine looking fly (full tying instructions at the Fly Paper link above). That is a fly I’d like to have in my box, and exactly the kind of fly I probably won’t tie because I have yet to tie a fly that called for a dubbing loop. I should really stop by Doug’s and figure that out. Doug… you around? How do you feel about teaching? You know, I’m an East Bay guy now. Those of you who tie, what are the flies that you’d like to tie, but intimidate you a bit? This entry was posted on Wednesday, August 22nd, 2012 at 1:44 am	and is filed under Flies. You can follow any comments to this entry through the RSS 2.0 feed. You can leave a comment, or trackback from your own site. Does anyone have instructions for tying a Simram? Going to Green Turtle Cay end of Oct. and this was recommended by guide, Denny Sawyer. Looks nice, but no fly should take longer to tie than it does to lose it. Thanks Bjorn. I saw a copy of the edition at Kiene’s Fly Shop last week. Like you I still haven’t seen my subscription edition. I don’t know how many days they delay the home subscribers from the shops and stores. Anyway, yeah, I’m around until the first week in Sept. Stop by anytime. I’m tying tube burbot imitations and floating mice for taimen right now. Capt G – generally I agree and I could lash a lump of coyote to a hook and probably catch bonefish, but where’s the fun in that? Fer chrissakes learn how to do a dubbing loop, to make it really easy, get a gallows for your vise. You will truly wonder why this has been a problem. Loooove dubbing things. Sometimes I’ll just dub stuff cause I have the urge. Dub step… rub-a-dub, dancehall dub mix, bus’ dis dub bredrin. I know it’s probably pointless, but it is easy and you can make dubbing out of dang near anything — yarn, flash, wool, polarfibre, shag carpeting, cat whiskers, etc. I’ve always just used the underfur from Craft Fur to dub my bonefish shrimp flies since the stuff will just be thrown away anyways. It’s perfect: non-buoyant, doesn’t absorb water, semi-translucent and comes in tons of bonefish-friendly colors. As for winding it onto the hook, I use an old lead egg sinker (about the size of one of those little Cadbury chocolate easter eggs) as my dubbing spinner thing and after I’ve spun the material in the loop I simply give it a little flip around the hook shank and it winds itself on with centrifugal force. It takes a little practice to do this so the wraps are tight to each other, but it will wrap the hook in about 1 second.